Nothing better to start the day than a morning walk or a jog on the famous Promenade des Anglais passing in front of the legendary Hotel Negresco. Probably one of the most beautiful hotels on the Côte d’Azur. After breakfast on the terrace, go to Old Nice, on the Cours Saleya market. The opportunity to soak up the Niçoise atmosphere and local colours. There are fruits and vegetables from the region, flowers. But also local specialities such as olive oil, spices, tapenade, anchovy, socca, and many others. The market takes place every day except Monday when the antique market takes place. We like its dynamic atmosphere, it’s full of people! Even the oldest can be heard discussing in Nissart, the local dialect. Then set off to discover old Nice, a real labyrinth! There are some key places to visit but then I really advise walk in its many alleys. The best way according to me to discover all the corners and atypical spots. Don’t miss the Pierre Gautier square where you can admire the palace of the prefecture (ancient palace of the Sardinian kings) and the chapel of Mercy. 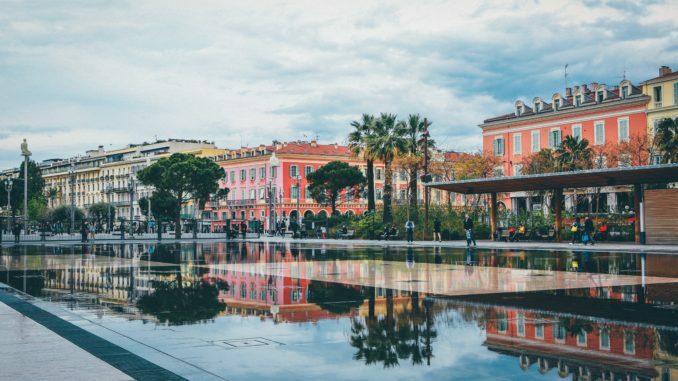 Then go to the courthouse square, known among other things for Spaggiari’s escape from the judge’s office, then head to Rossetti square, one of the busiest places in Nice. We love its beautiful terraces, its cathedral Sainte Réparate and of course its mythical glacier, Fenocchio, famous for its delicious ice creams with many original flavours. (tomato basil, thyme, avocado, beer, calisson, etc.). Then take rue Droite to go to the fish market in Place Saint François. On the way you will pass through the majestic Lascaris Palace, a marvel of 17th and 18th century baroque architecture that is reminiscent of Genoese palaces with its monumental staircase adorned with frescos and its luxuriously decorated salons. Enjoy the best of Nice’s culinary specialities in the restaurant Chez Pipo, located in the harbour district at 13 rue Bavastro, a real institution in Nice, well known to the locals. Discover the best Socca de Nice, the pissaladière, the daube niçoise and the sweet chard pie. After a hearty and succulent meal, go for a digestive walk on the Coulée Verte / Paillon gardens, inaugurated in October 2013. A green lung of 12 hectares in the heart of Nice that separates the old town from the contemporary, on the route of the Paillon river. The new meeting place for locals and tourists who have come to rest and enjoy this pleasant green setting. There are many facilities for children, shaded areas, and many fountains. Coup de coeur for “Le plateau des brumes”, a surface of nearly 1400m2 equipped with hundreds of misters… Happiness during hot summer days! Go for a ride from 2:00 to Segway gyropods towards the Castle Hill. A must in Nice! The first hour of walk is devoted to the discovery of the city center where one circulates at the same speed as the passers-by, but the second hour, one rides at full speed (20km/h) towards the top of the hill. Disconnection and sensations guaranteed! After having passed the two cemeteries with impressive mausoleums, we go to admire the first panorama which overhangs the large coloured port of Nice, then, the most beautiful for the end, the exceptional panorama on the bay of Angels… A breathtaking sight! Surely the most beautiful in Nice… A Segway gyropod ride is the opportunity to visit Nice in a fun way, in small groups, in the company of guides native to the region, and to discover the best of the city in record time! Take a walk up into the Cimiez arena district to visit the Matisse museum and also discover this beautiful 17th century Genoese villa, entirely renovated, located in the heart of the olive grove of the Cimiez gardens. Did you know that this famous painter lived in Nice from 1917 until his death in 1954? You could also visit the Musée d’art moderne et d’art contemporain de Nice (MAMAC) located not far from Place Garibaldi and which exhibits works by sculptor César, Niki de Saint Phalle, Yves Klein, François Dufrêne, Jean Tinguely, Gérard Deschamps, Ben, but also Andy Warhol and Roy Lichtenstein, masters of Pop art. On your way back to the city centre, make a stop at the Russian Orthodox cathedral in Nice, just a stone’s throw from the station. The time of a short visit would make you feel out of time, at the time of the Tsars, on the Red Square of Moscow! Want to discover new destinations in Europe? We recommend you our article about Amsterdam.